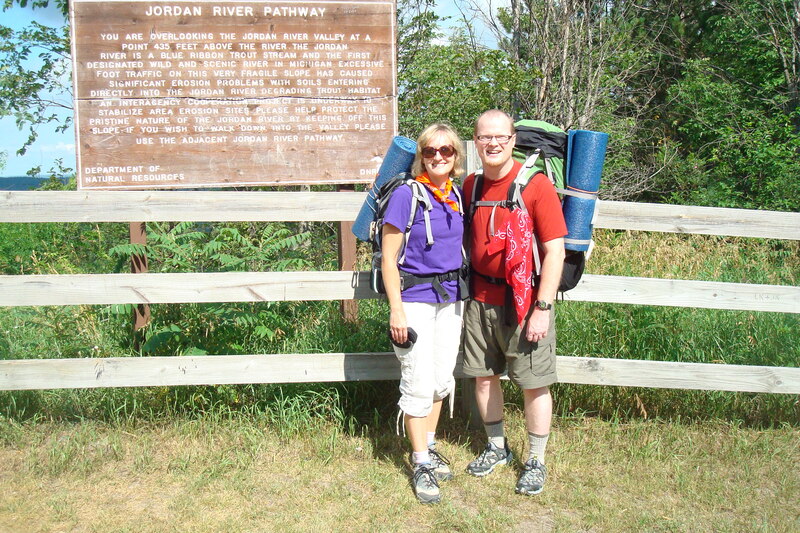 Last month I completed my first overnight backpacking trip with my husband, Brad. We hiked the Jordan River Valley loop in northern Michigan. We hiked nine miles the first day, and a little more the second day. The weather was perfect (highs in the 80s; lows in the 60s); the views were amazing (wooded valleys, tall pine trees, some grasslands, and multiple water crossings); and, of course, time together as a couple. I couldn’t have asked for a better first backpacking experience, and I am well aware that not all backpacking trips are as fun and pleasant. I need to back up, though, and explain how I came to go on this adventure in the first place. Brad is definitely a backpacker. I, on the other hand, consider myself to be a “day-hike-kinda-girl.” I love to be in creation. I love the feeling of a good workout. But I also love my bed, a hot shower, and strong coffee in the mornings. So for several years now Brad has taken each of our children on different backpacking trips while I have stayed home enjoying my creature comforts. It became increasingly clear to me, however, that if I went on a backpacking trip with Brad it would mean the world to him. So earlier this spring I proposed to go with him on a trip this summer if he could promise me decent coffee and some semblance of feeling clean. It was a deal! We purchased a pack for me, and who knew that baby wipes and rubbing alcohol could be so effective in controlling unpleasant body odors. And since Starbucks now has passable instant coffee the plans were set. Anyway, I loved the feel of taking off my pack once we reached our campground. I never knew I could feel so light. I also loved the fact that it was just the two of us. We didn’t pass a single hiker the first day. There aren’t many days in my regular life where I interact with so few people. Hiking is not a rushed activity. I suppose a person could try to see how fast they could get from one place to the other, but that defeats the purpose. You have to notice things when you hike–like the trail markings, the spider webs, poison ivy, and the trail itself. I guess the question is: will I go again? Yes, I will. I’m with ya, gal. I love getting out there, carrying everything on my back, seeing nature and feeling along, but I’m so thankful for my shower and bed upon return. You had a toilet, water pump and picnic table at your campground? Wow, impressive. I’m used to digging a hole, pumping water from a lake or stream and sitting on rocks. That was a nice camp ground. Enjoyed your comments about getting back home and in your own bed. Couldn’t agree more! Also the backpacking blog was enjoyable to read. Mom and I will probably never do that kind of thing again but glad you and Brad can share the experience. We’re starting to get serious about packing! The other night we skyped Nate and Paige. How neat! Look forward to talking and seeing you and Brad and the kids. Hey Alicia. You did it! Loved reading your comments about your backpacking trip. I’m so glad you and Brad do these things and…together. I just posted my second time on my blog. We are in countdown mode for Israel! Keep up the great writing. Alicia, it was so good to get to read this entry as well as the ones that came before it. It certainly gives me a sense of your life today, but also reminds me that even with all the years that have passed between us, there are two things that remain. You are as thoughtful and God-centered now as you ever were. It’s beautiful to know you, my friend. It is great to hear your “voice” via your blog and learn a bit about your life! Thank you for sharing your heart and your stories. I look forward to reading more!